Thanks to three new features in Lion—and improvements to one older feature— losing your data or your place may soon be a thing of the past. Versions, Auto Save, Resume, and Time Machine combine to make sure that not only are your documents thoroughly protected from inadvertent loss, but that you don’t really have to lift a finger to keep them safe. The introduction of Time Machine in Mac OS X Leopard was a revelation. Backing up your hard drive had been a pain; here was software that promised to make it painless. While Time Machine is not without its flaws, I’d bet that more Mac users regularly back up their work now than before it came along. But for some, Time Machine doesn’t go far enough. One weakness: It backs up only once per hour. What if you want to go back to a version of a document as it stood twenty minutes ago? What if you’re on a laptop and not connected to your Time Machine drive? What happens to your data then, smart guy? Versions is Apple’s answer to both problems. This isn’t a versioning system like CVS and Subversion, which developers have been using for years to resolve conflicts when multiple people are working simultaneously on the same files. Rather, Versions is all about the changes you make. Accidentally delete a paragraph from your history paper? Versions can get it back for you. Want to go back to the second draft of that report? No problem. Later decide maybe you didn’t want to go back to that earlier version? Versions is there for you, again. Whenever you make significant changes to your document, Versions takes note of it. What’s a significant change? Pretty much anything, it turns out, from deleting a paragraph to adding a new line of text or inserting a picture. Versions also saves a snapshot of a file when you open, save, duplicate, lock, rename, or revert to a previous version of it. All of this happens in the background. When you decide you want access to one of those older versions of a file, you can do so in two ways. First, you can open the File menu and there choose to revert to either the last saved or last opened version of it. Or you can click on the disclosure triangle that appears when you hover the cursor over a document’s title bar, which opens the Versions menu. There, you can opt to lock or duplicate the document, revert to the last saved version, or browse all versions. That last option moves you into a Time Machine-style interface showing two versions of your document: The current one on the left and the most recent saved one on the right. Behind the latter, older versions stretch back into space (just like Time Machine). To select one of those older versions, you can click on its title bar to bring it to the foreground, or use the history slider on the right to find a version by a time and date. At the bottom of the screen you’ll see two buttons: Done and Restore. The first exits the Versions interface and puts you back in your app without making any changes; Restore replaces the current version with the older one you’ve selected. Comparing the current (left) and older versions (right) of a document. The older versions are also interactive: You can copy text from them into the current version. So if you deleted that iffy sentence at first but then decide to restore it without touching all the other alterations you’ve made in the intervening time, you can. If at any point you’ve got a document just the way you like it, you can prevent changes from being made by selecting Lock from the Versions drop-down menu. A little padlock will appear next to the document icon in the title bar (and in the Finder) and the word Locked will appear in grayed-out text in the title bar. If you try to make any changes to a locked file you’ll be prompted either to unlock it or to duplicate it and work from the copy. In my brief time with Versions, it’s worked surprisingly well. I’ve made several changes to a document and been able to go back and view the older versions, even raising long-dead paragraphs from the mist. One thing I wished for: an option to search older versions, in case you can’t find a certain piece of text. It might seem like Versions would consume a ton of hard drive space, But because the system saves only the history of your changes, rather than a full copy of every changed document, it uses only a fraction of the space it otherwise might. Like many of the other new features in Lion, vendors will have to add support for Versions into their apps. But given the benefits to end users, it seems likely we’ll see plenty of updates in Lion’s wake to bring this feature to the masses. Command-S, command-S, command-S. It’s been drilled into us since time immemorial: Save your work. Anybody who’s ever lost data knows how painful it can be if you didn’t have a saved copy—especially because you know the loss was preventable. But Lion makes command-S almost unnecessary, because it automatically saves your work whenever you make changes. You don’t need to do a thing. In practice, Auto Save works pretty well, even if it might be a little hard for long-time Mac users to fully trust it. You can still hit that reflexive command-S if you really want, to ensure that your most recent changes are definitely written to disk. In my testing deliberately not saving open documents, though, I still retained pretty much every change I made—you have to work pretty hard to get Auto Save not to save something. Lion is also doing away with the Save As command; instead, you use the Duplicate command in the Versions drop-down and the File menu to create a new copy of a document. If there’s one problem with Auto Save in practice, it’s that it’s not available in every app by default: As with Versions, it requires developers to integrate support for it into their applications. Adoption will surely grow as Lion matures, but, in the meantime, a lot of users will need to keep hitting command-S.
We’ve all done it: accidentally quitting a program when we meant just to close a window. Then you have to launch the app again, reopen all your documents, reorganize all your windows, and generally get everything back the way it was. With Lion, Apple aims to make that process a thing of the past. You can opt to resume exactly where you left off after a restart. 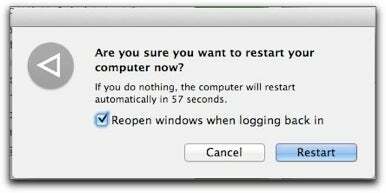 Resume works not only when you quit and reopen an app, but also when you restart your Mac. In fact, when you select Restart, Shut Down, or Log Out from the Apple menu, you’ll see a checkbox that lets you specify whether you’d like windows re-opened when you log back in. If you ever want an app to not reopen the way it was, you can hold down the Shift key while launching it. When Resume works, it feels truly magical. But, like Auto Save and Versions, it needs support from third-party developers to reach its full potential. Right now, not all apps take advantage of it. 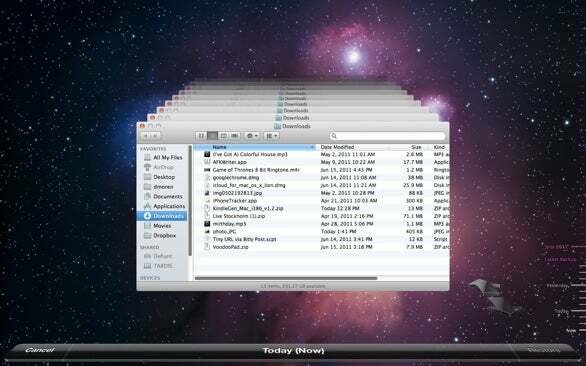 Time Machine’s introduction in Mac OS X Leopard was a boon to all those Mac users who never backed up their data. Lion brings only a few new features to OS X’s built-in backup system, the most significant of which are the ability to encrypt your backup disk and support for local snapshots. The ability to encrypt your backup disk is clearly part of a larger data security push throughout the OS (see File Vault 2). When you set up a new Time Machine disk, all you need to do is check the box marked Encrypt Backup Disk and then enter a password. Whenever you connect your Time Machine drive, you’ll be prompted to enter the password (which can of course be stored in OS X’s keychain). But if someone without the password tries to plug the drive into their own computer, they’ll be unable to access the data. It’s a nice move to secure an often overlooked part of the data chain. Laptop users will also be glad for another new Time Machine ability: local snapshots. Most of us don’t travel with our Time Machine drives, but on occasion we may want to retrieve a deleted file. In Lion, OS X keeps local backups of deleted files (“as space permits,” Apple says). So if you’re on a trip and have accidentally deleted, say, a photo, you may be able to retrieve it by going into the Time Machine interface as normal. In my brief testing, it worked without any hiccups, allowing me to retrieve a deleted file even after I’d emptied the trash. Time Machine now saves local snapshots of deleted files, so you can restore them even when you aren't connected to a backup drive. When you plug your Time Machine drive back into your Mac, those snapshots are moved to your backup drive, consolidating all of your backup data in a single, easily broweable location. The Time Machine preference pane and interface have received a few minor tweaks of their own. For example, when you click on Options in the preference pane, you now have the choice of locking documents (in those apps that support Auto Save) one day, one week, two weeks, one month, or one year after their last edits; that saves you from accidentally making changes to documents you mean to preserve. And the Time Machine interface now highlights the date of your last backup in the timeline on the right-hand side, coloring it and any backups before that in purple so that you can easily find them. Finally, while you’ve long been able to quickly and easily move your data from a Time Machine backup to a new computer via Apple’s Migration Assistant, you can now do the same via Lion’s Recovery Mode. So if your Mac throws a hissy fit, it’s easy to restore its data right back to where you were. Taken together, Auto Save, Time Machine, and Versions should provide a pretty big safety net for data loss. That’s not to say that you should stop taking extra precautions such as offsite backup or using services like Dropbox or Apple’s forthcoming iCloud to maintain copies of critical documents. But for less experienced users who wouldn’t know where to start, Apple’s made protecting your data easier than ever. One other thing many of these new features have in common: They’re further instances of OS X borrowing ideas from iOS. For example, between Resume and the removal of those little blue lights in the Dock that indicate open programs, it’s much harder to distinguish programs that are running from those that aren’t—just like on the iPhone or iPad. Auto Save is another idea that seems familiar from iOS: You don’t have to save your work in most iOS apps, either. It seems to be yet another step in Apple’s campaign to make us stop worrying—or even thinking about files.